Ask any beer-lover about their favorite holiday, and they probably have a St. Patrick’s Day story up their sleeve. Traditionally, St. Patrick’s Day celebrated the arrival of Christianity in Ireland and is celebrated on the day the patron saint of Ireland, St. Patrick, died in 461 AD. Today, however, the holiday has evolved into a celebration of Irish culture and heritage all over the world — especially here in the United States, Australia, Great Britain, Canada, and of course, Ireland. Lucky for us, beer-making (and drinking) have a deep-seated history in Ireland, and St. Patrick’s Day celebrations bring out the best of both. If you’re as excited for St. Patrick’s Day as we are, we thought you’d be interested checking out these 10 ways to celebrate one of our favorite holidays. 1. Dress up like a leprechaun. Instead of wearing green like everyone else, dress up like a leprechaun … Okay, hear us out on this one. The tradition of wearing green on St. Patrick’s Day dates back to the 1700s. It was said that if you wore green, you would be invisible to leprechauns and fairies, who went around pinching anyone and everyone who wasn’t wearing green. Therefore, by dressing up as a leprechaun, you get to be the annoying person who pinches people! Sounds fun, right? Many cities have 5k fun runs the weekend of St. Patrick’s Day which is a fun way to celebrate with a group of friends or your family. Here in Central Indiana, we have the Shamrock Run and Walk which begins and ends on Monument Circle in downtown Indianapolis. There’s usually beer involved before, during, and/or after these events. So with that in mind, run (and drink) at your own pace. Seriously, we’re not kidding. If you’ve been bitten by the travel bug, head on over across the pond to celebrate St. Patrick’s Day in the motherland. Start your trip in Dublin, where the city hosts a 5-day festival to celebrate the holiday. Use websites like AirBnB and Kayak to book your trip on a budget. 4. Eat traditional Irish food. Get into the spirit with some traditional Irish fare at your local pub, or make your own at home. Corned beef and cabbage, Irish stew, and Shepherd’s pie are a few favorites, but if those flavors aren’t your thing, you can always just drink more beer. 5. Listen to Irish music. Why is it that Irish music just seems to make people more rowdy and fun? Put together your own playlist of Irish music (think Flogging Molly and Dropkick Murphys), or check out this Happy St. Patrick’s Day playlist from Spotify. Why not? St. Patrick’s Day is the perfect excuse to invite over your best friends and family for a fun social gathering. If you don’t want to do it on the actual date, celebrate the weekend before or after March 17 to either get people in the spirit, or keep the party going. 7. Attend a local parade or festival. Most towns and cities in the U.S. will honor St. Patrick’s day with some sort of parade or festival. Attend the celebration wearing green (or, even better, see #1 above) and enjoy the dancing, singing, eating and drinking that’s sure to follow. 8. 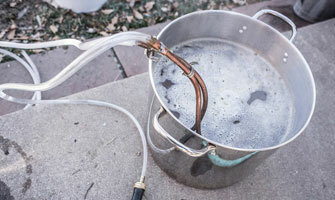 Brew your own Irish beer. 9. Whip up some Irish Coffee. When you’re sick of drinking beer, you can switch to this tasty, traditional beverage. To make yours authentically Irish, mix your coffee with Jameson, sugar, and top with heavy cream. Pro tip: If you’re heading to a local parade and it’s a little chilly, an Irish Coffee in a Thermos is a must-have … sneaky, sneaky. But please, whatever you do, avoid the green beer. Instead of sipping on that cheap, tainted brew, order a pint of Guinness Extra Stout or another Irish-inspired choice. Guinness will probably be on special at most pubs and bars on St. Patrick’s Day, anyway. And as the national drink of Ireland, we can’t argue with that. Have a pint (or two) of the popular stout and enjoy. However you choose to party on St. Patrick’s Day, have fun and drink responsibly!